The private sector grew 2.2% from last year – the highest rate of growth in eight months. Personal bankruptcy filings are nearing pre-recession lows. Despite a slowdown in overall construction, residential projects are gaining steam in Manhattan and the Bronx. Residential rents are slightly down as home values continue to soar. Subway and bus ridership continues to fall while tourism remains stable. 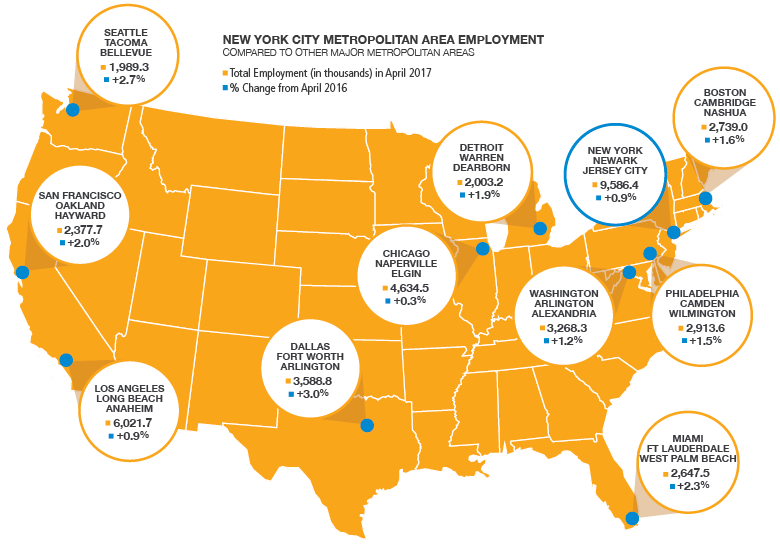 It’s been just eight years since the height of the Great Recession and the devastating toll it took on the global economy, but now economists are debating whether New York City—and the nation as a whole—are currently in a golden era of “full employment." Private sector employment rose sharply in May with an increase of 29,800 jobs – the largest monthly jobs increase since January 2017. This is the fourth consecutive month that employment changes have reversed course from the previous month.1 Overall employment declined by 8,900 jobs last month while the largest gains in May were made by Administrative Services, Professional, Scientific, and Technical Services, and Accommodation and Food Services, each of which added more than 4,000 jobs. Information and Manufacturing were the only sectors to lose jobs, shedding 1,100 and 800, respectively. Average weekly wages fell slightly in May compared to last year. Despite hourly wages rising modestly (up 1.2% to $34.99), average hours worked per week have fallen 2.3% to 33.7 hours, a near-historic low. Consequently, average weekly wages decreased by 1.1% from last year (after adjusting for inflation). Average weekly wages in the US fell 0.9% over the same period. The unemployment rate rose to 4.3% in May, up from 4.1% in April. This level of unemployment is on par with that of New York State and the US. The City’s unemployment rate fell 0.9 percentage points from last year. Labor force participation continues to rise to record highs reaching 61.6%, up 0.3 percentage points from April, partially accounting for the rise in unemployment. 1January employment data incorporates an annual benchmark revision and is typically subject to major revisions. Because data may display high volatility, year-over-year change may be more indicative of labor market trends. 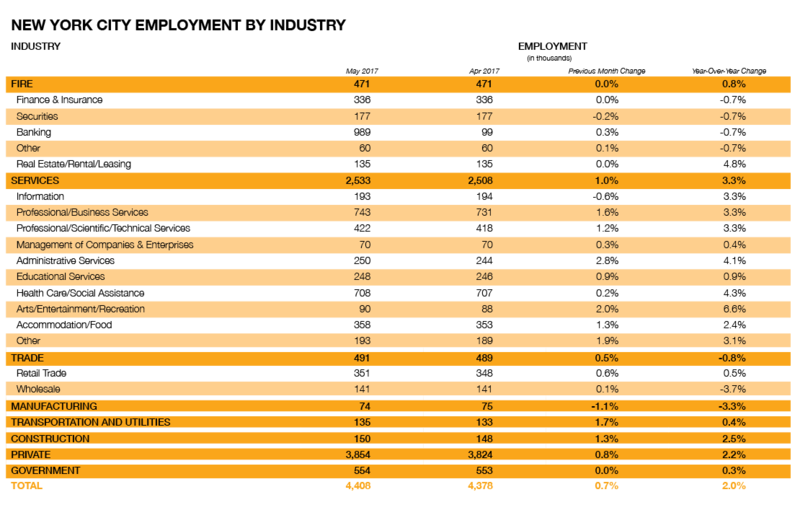 Since the early 1990s, the lowest number of personal bankruptcy filings in New York City was in 2006 when only 7,962 individuals filed for bankruptcy. Compare that to the all-time high of 42,854 in 2005, 17,691 in 2010 (recession peak), and 8,700 in 2016. The massive decline in filings between 2005 and 2006 is because of sweeping bankruptcy reform laws, which made eligibility for Chapter 7 much tighter across the country. The number of personal bankruptcy filings has gone down in New York City since the recession at a faster rate than across the country. The decline in personal bankruptcies is a positive sign for New Yorkers, signaling healthier finances for individuals after years of expanding consumer debt brought on by the financial crisis. New Yorkers tend to have more debt than the average American – the average credit card debt per household is roughly $5,700 compared to $6,390 in New York State (2016 data). Construction project starts were significantly lower than the twelve-month average ending May 2017. This is the fourth consecutive month that project starts were lower than prior-year averages. Construction began on 1,590 residential units – 12.6% lower than the previous twelve-month average. 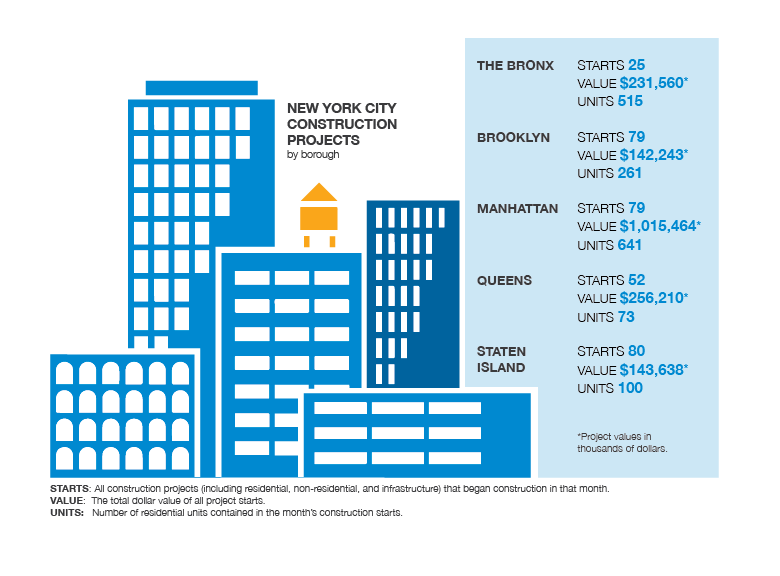 Nevertheless, residential construction was relatively high in the Bronx and Manhattan, with unit starts more than 60% higher than past year averages in both boroughs. While residential construction numbers are encouraging, the value and size of new construction projects are down compared to the same time last year. 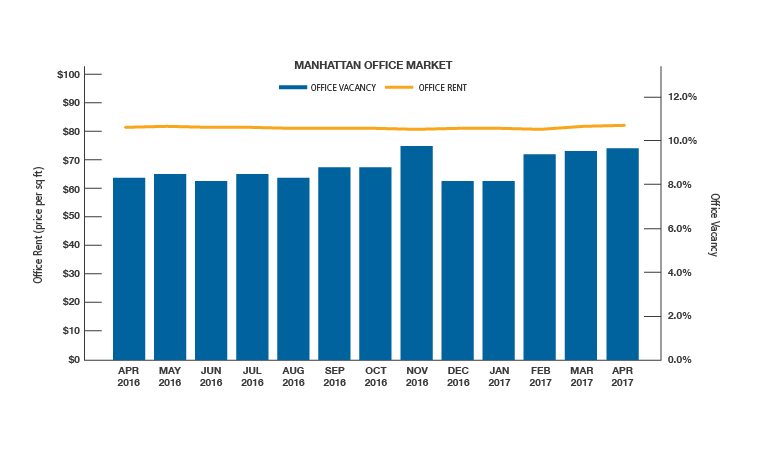 Residential rents in New York City continued their slight decline in May. After two months of negligible change, May rents fell an average of 0.4% from last year. This marks the seventh consecutive month that rents have not risen from prior-year levels. Rent stagnation indicates that a slow in population growth and an increase in housing supply have dampened price growth after more than five years of year-over-year rent increases that far exceeded consumer price inflation. On the other hand, home sales prices continued to rise at an increasing rate. Average home values in May were 15.2% higher than the prior year – the fastest rate of increase since 2006. Ridership on local transit systems continued to fall in April 2017. MTA New York City Transit, which operates subways and buses, led the losses. Twelvemonth average ridership hit their lowest levels since 2013 and is in the midst of its longest period of losses since late 2012. Commuter rail ridership also fell from last year – the third consecutive month of declines. Automotive traffic on bridges and tunnels, however, rose from last year. The tourism sector appears strong as Broadway revenues and attendance surged compared to April 2016. Airport traffic also showed renewed growth after wobbling last month for the first time since 2014. These increases were largely driven by a greater number of international flights and fuller planes.